In 1841, Douglass spoke about his slave experiences at a convention of the Massachusetts Anti-Slavery Society held on Nantucket Island. He impressed prominent abolitionist leaders, including Garrison, and was hired as an anti-slavery lecturing agent. Douglass moved his family to Lynn, Massachusetts, and spent the next few years giving hundreds of anti-slavery speeches. In 1843, he joined a group of anti-slavery lecturers on a "One Hundred Conventions" tour, a grueling schedule of stops that included upstate New York, Ohio, Indiana, and western Pennsylvania. 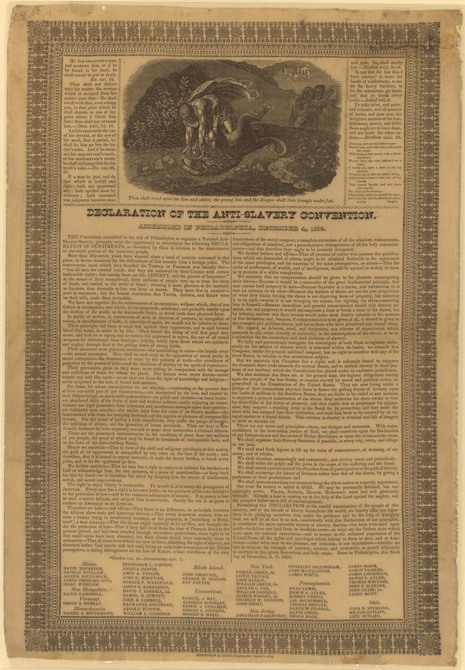 At an antislavery convention in 1841, he was asked to speak extemporaneously about his own experiences; his remarks were so poignant and naturally eloquent that he was catapulted into a new career as an agent for the Massachusetts Anti-Slavery Society. To counter skeptics who doubted he could ever have been a slave, he wrote his autobiography in 1845, revised and completed in 1882 as Life and Times of Frederick Douglass. It became a classic of American literature as well as a primary source about slavery from the bondsman's viewpoint. After a two-year speaking tour of Britain and Ireland, he returned with funds to purchase his freedom and to start his own antislavery newspaper, The North Star (later Frederick Douglass's Paper), which he published from 1847 to 1860 in Rochester, N.Y. He broke with William Lloyd Garrison over the need for a separate, black-oriented press and the need for political action in addition to moral suasion, and from 1851 he allied himself with James Birney's abolitionist faction.